You begin by deciding on your basic requirements such as size, style (bungalow, split, two-storey), and function of the home – is it a family dwelling only or will you be working out of your home? Also consider convenience; is your location easily accessible to transportation, schools, shopping and other amenities? The more realistic and detailed picture you can create, the easier it will be to create the right home. How Do I Choose A Home Plan? 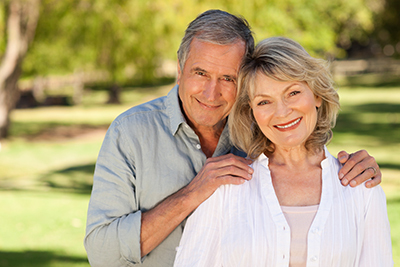 Creating a home plan couldn’t be simpler. Thanks to Huntington Homes’ in-house design center – “Huntington Design”, you’re able to browse our extensive computerized plan database. Your home criteria are entered in and the computer short-lists home plans that meet your needs and preferences. You’ll find it easy to envision your new home as you participate in the creative process. How Long Does It Take To Build A Huntington Home? Once the design process is completed and the digging process has begun, it takes on average between nine and twelve months to build your custom home. Is Huntington Homes A Member Of Any Home Builders Associations? Yes. Huntington Homes is a member of the Manitoba Home Builders Association and the Canadian Home Builders Association. Is Home Building Your Only Business? Yes. New home building is a serious business. 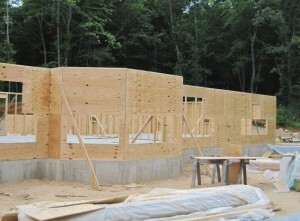 Home building requires solid building and business skills and a proven track record. Huntington Homes builds 100% new custom homes. How Do You Ensure A Quality Home? Huntington Homes works with an established “team” of trades people and suppliers who have been carefully chosen and trained to use our quality standards. The benefit to our approach is that we’re getting the same “team” of people building ALL our homes. This is Huntington’s way of ensuring that you get the level of quality you expect. Huntington Homes has researched and pre-negotiated competitive cost schedules with each of our trades and suppliers for every aspect of construction. Each trade and supplier must earn and keep our business by staying competitive. How Much Do You Charge Per Sq. Ft.? Building professionals do not price homes according to square footage. The reason is that the construction cost of homes does not vary directly according to square footage. Some areas of a home cost more than others. For example: enlarging a kitchen costs more than enlarging a bedroom because kitchens cost more per square foot than a bedroom. Our computer-aided design software is actually a virtual construction site where homes are designed and built using 3-D elements and components such as walls, roofs, windows, sinks, etc. Each component contains information about its size and geometry. When the design is finalized, a detailed material and component data file is automatically produced and the information transferred to our pricing software. Here the price of your home is accurately calculated. I’ve Heard It Can Be Difficult To Have a Home Built? Home building is a complex, detail-oriented process. Difficulties that arise between a builder and a client usually occur when there is a difference in understanding between the two. To eliminate miscommunication, Huntington Homes develops highly-detailed plans and specifications for your new home, leaving nothing to chance. The vision of what is being built is exactly the same in your mind, your spouse’s mind, and our minds. What Have You Done To Address Common Construction Problems? Huntington Homes’ goal has always been to reduce and eliminate “typical” home problems by the way we design and build new homes. Years ago, Huntington conducted an extensive survey of homeowners to isolate “typical” problems experienced in Winnipeg homes. We then worked with our engineers and designers to eliminate these typical problems. What Are Foundation Piles And Do We Need Them? 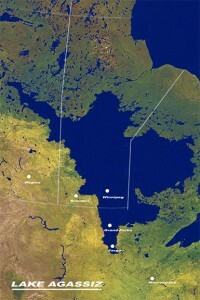 Winnipeg and surrounding areas sit on the former lakebed of glacial Lake Agassiz (which ceased to exist approximately 10,000 years ago). The soil consists mainly of expansive clay up to 60 feet thick, resting on limestone bedrock. This clay has high swelling potential of up to 15,000 lbs. per sq. ft. Most of the single-family homes in Winnipeg are constructed on shallow footings directly on the clay. These homes have a long history of heaving associated with moisture changes in the soil. As a result of the movements, many houses suffer from cracks in walls, ceilings and basement floors, as well as uneven floors and doors that bind. In some instances, the cost of repairs has been as high as 25% of the house replacement cost. 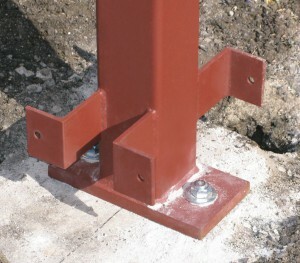 Foundation piles are used to eliminate the problems associated with shifting foundations. 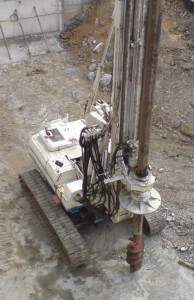 Piled foundations are the deep foundation systems typically used in areas of expansive soils. Piles generally range in length from 20′ to 30′ depending on soil conditions and loads as determined by an engineer. All Huntington homes have been constructed with engineered pile foundations since 1989. Why Does Huntington Use Pre-Finished Hardwood Floors? 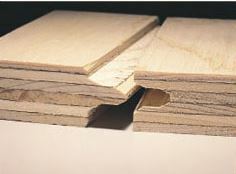 Engineered pre-finished hardwood floors are produced in a factory environment. This virtually eliminates the occurrence of dust in the finish, sanding marks that occur in sand-on-site flooring, and permits deeper penetration of the coatings through high temperature application. Engineered hardwood floors do not expand and contract due to humidity changes making them a more stable product. In addition, engineered pre-finished floors have aluminum oxide in the finish to provide long-term durability. Pre-finished floors come with long-term warranties, which are not available with sand-on-site floors. Finally, if repairs are required, pre-finished hardwood boards can be replaced individually rather than refinishing the entire floor. Will My Basement Floors Crack? Homeowners in Winnipeg and surrounding areas should accept the fact that concrete basement floors generally undergo significant heaving, cracking, and buckling. Unfortunately, concrete basement floors cannot be designed to resist vertical heaving because uplifting pressures exerted by expansive soils can greatly exceed the weight of the concrete slab. Repair and replacement is costly and is not guaranteed under the provisions of any builder’s or building association’s warranties. To eliminate this problem, Huntington Homes became the first builder to standardize a new floor system known as a “wood structural floor”. 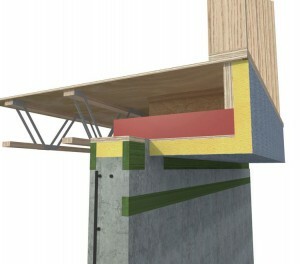 This system isolates the floor from the soil movement. It consists of a wood engineered floor system suspended above the soil on the foundation piles and a crawl space is created between the floor and soil surface allowing for inspection and permits proper ventilation. What Type Of Floor System Do You Use? Huntington Homes was the first to standardize the use of manufactured floor joists in 1989 in place of the traditional “2 x 10” lumber joists. 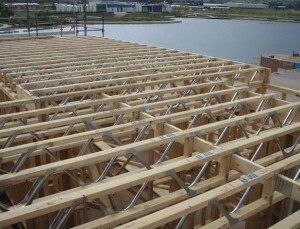 These engineered joists offer superior performance by virtually eliminating shrinkage, twisting, and warping. I’ve Heard New Homes Are Quite Airtight – What About Fresh Air? Today’s homes tend to be considerably more airtight than in the past. Huntington homes are especially well sealed by incorporating the latest in construction technology as standard. 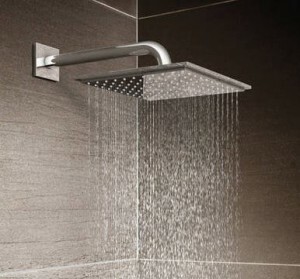 A well-designed heating and venting system is a critical requirement. All our homes come standard with a heat-recovery ventilation system (HRV), which draws fresh air from the outside, pre-conditions it, and distributes it throughout our homes. Huntington further enhances homeowner comfort by utilizing high-efficiency multi-speed furnaces and “Zone the Home” which provides multiple thermostats allowing the homeowner to pre-program each area of the home to suit their needs. How Does The Component Selection Process Work? Certain components of new homes such as flooring, cabinetry, lighting and plumbing fixtures require customer selections as to type, style and colour. Many builders use “allowance” amounts for selection items, which often do not correspond with actual requirements and leave you with insufficient funds, or surprise costs. Huntington Homes has created budgets for each selection item required for your home. Our budgets are based on actual requirements and use components from some of the most well respected brands in the industry. What If I Come Under Budget With My Selections? Huntington Homes will refund any unused portion of a selection budget. What Is The Warranty On My Home? Huntington Homes is a member of the National Warranty Program. To qualify for registration, a builder must pass a rigorous evaluation of their technical expertise, track record, financial position, and have a proven reputation in the industry. Registration attests to a builder’s commitment to quality materials and superior workmanship. During the first year of the Warranty, Huntington Homes will repair any defects in workmanship and materials. For an additional four years, Huntington Homes and the National Home Warranty will repair, at their cost, any major structural defects. This covers the load-bearing portions of the home including the piles, foundation walls, grade beams, bearing walls, floor joists, beams, roof trusses, etc. If the home is sold during the warranty period, any remaining coverage stays with the home for the benefit of subsequent owners. Knowing in advance how much you can borrow and securing your lender’s pre-approval for that amount makes it easier to explore your options with confidence. We encourage you to bring your questions and concerns to us; we will be pleased to discuss them all.